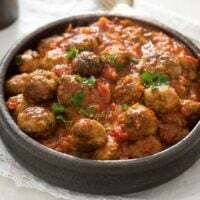 Spanish tapas – albondigas or Spanish meatballs, these are some of the best meatballs in tomato sauce, Spanish food at its best. 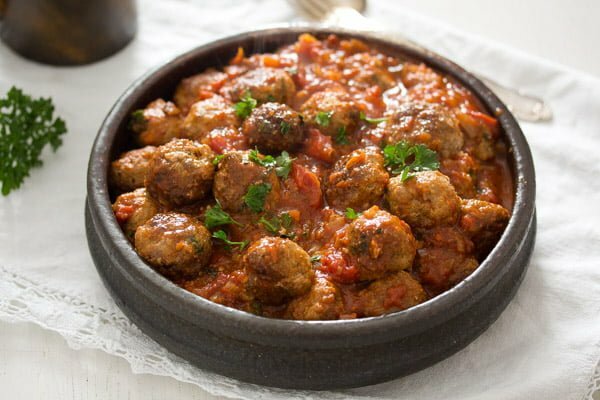 Finally I get to post this recipe for Spanish albondigas in tomato sauce. It was one of the first I have actually cooked for this now way too long World Cup food series on Where Is My Spoon. But I saved the pictures in the wrong file and I just couldn’t find them anymore. I cooked the dish again last week, because it was so good and my daughter wished me to cook the meatballs again (this time with spaghetti) and while the sauce was cooking I used the time to search for the photos for another post I wanted to write. And surprise surprise! I did find the pictures for the Spanish albondigas . So, we ate the meatballs in tomato sauce on that day, but I didn’t have to bother to take new pictures. These Spanish meatballs in tomato sauce are some of the best I have ever eaten. I have made this kind of dish dozens and dozens of times over the years, my husband and my daughter are big fans and wish for spaghetti with meatballs and tomato sauce all the time. But still I find this particular recipe to be even better than the usual one. Well, the usual one not really being a written and exact recipe, I have been making meatballs in tomato sauce so often, I haven’t been needing a recipe for years. Mostly I cook the meatballs in tomato sauce the way my grandmother did, sometimes I cook them like my mother-in-law, sometimes I just dump some leftover meatballs in some homemade canned tomato and vegetable sauce. So why do I like this particular recipe more than the others? Well, I think is the use of fennel seeds in the tomato sauce. I did use fennel seeds in other recipes (for instance my favorite zucchini soup), but it is only recently that I have started to use them often. I absolutely love their flavor. 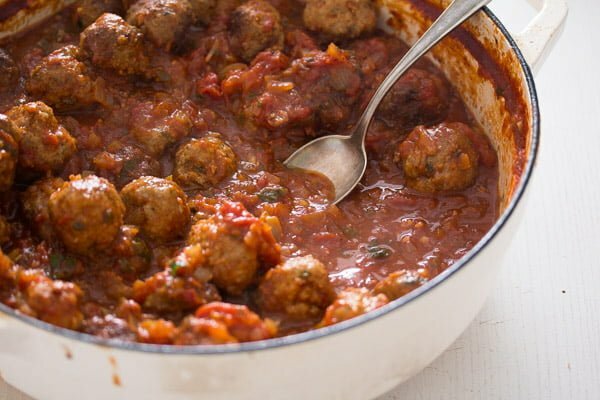 You don’t need that much fennel seeds for these meatballs in tomato sauce, but they definitely give the sauce a special flavor that, for me at least, just brings this tomato sauce to a whole new level. You should definitely try it! Of course, if you don’t like fennel seeds at all or you cannot find them, you can leave them out, but if you do happen to have them, you should use them. 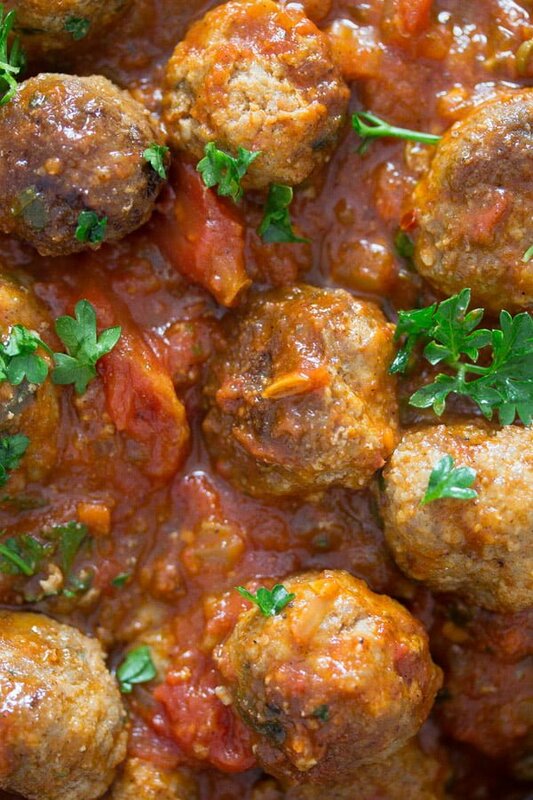 Albondigas or meatballs in tomato sauce are often seen as tapas in Spain. Tapas are small portions of food typical for the Spanish cuisine. They are usually served with drinks, sometimes free of charge, if you are in Spain. Tapas should not be considered an appetizer, usually if you start eating tapas then you end your meal eating tapas. In Spain you can go out for tapas, so to say. That means you would be going from bar to bar, having a drink and eating one type of tapa and then moving on to the next bar. The Spanish word “tapear”, actually means “to go out for tapas”. Definitely something I would love to do. According to some sources the tapas were served by innkeepers to travelers as a sample of their food. Most people would not be able to read a menu, so they would be served these small samples to convince them to order more. Other sources claim that the tapas were originally small slices of bread, ham or cheese, which were placed over a glass of wine or other drinks to keep the flies away. Another story says that the tapas were the result of King Alfonso X – The Wise One’s struggles to keep men from getting too drunk. He thought that having a bite to eat with every drink would keep the alcohol from getting straight to the head and thus reduce the level of intoxication. A tapa is not a particular kind of food, it can be most anything (even paella) as long as the portion is small. Some of the best known tapas are the tortilla espaniola, which is some kind of omelet with potatoes. And of course, the most simple tapas: ham, cheese or chorizo on thinly sliced bread. Then you could also have potatoes in a spicy sauce – patatas bravas, potatoes with aioli – patatas alioli or “wrinkled” potatoes – papas arrugadas. 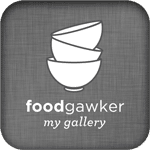 Ham croquettes – croquetas de jamon, pickles on toothpicks – banderillas, olives – aceitunas, salted cod – bacalao, fried squid – calamares, dough pockets stuffed with meat or vegetables – empanadillas, prawns – gambas. You could also have cheese with anchovies on top – queso con anchoas (definitely something for me), octopus – pulpo, fried green peppers – pimientos de padron (I’ve made them quite often myself), deviled eggs – huevos rellenos and so on. All of them very easy to cook at home as well, provided you find the right ingredients. It might get tough around here with finding octopus, but otherwise I cannot see why I could not make each and every one of these tapas. And a very popular kind of tapa are these albondigas or Spanish meatballs in tomato sauce. You can indeed serve them as a tapa in a small dish or serve them as a full meal as I do most of the times. If serving as tapa, best thing to eat with the albondigas would be some crusty fresh bread. If serving the albondigas as a main meal, you could have them with spaghetti or other type of pasta. You could also cook some rice or make some nice mashed potatoes. 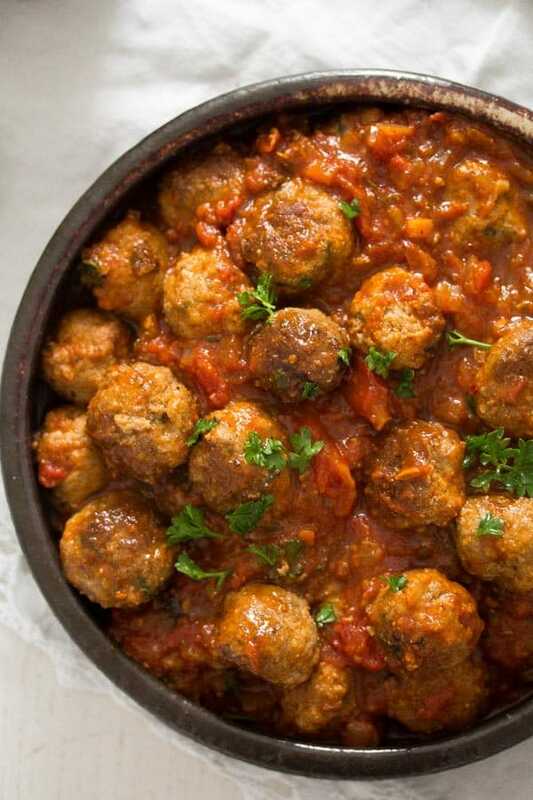 This recipe for albondigas in tomato sauce serves 8-10 as tapas or 4 as a main meal. 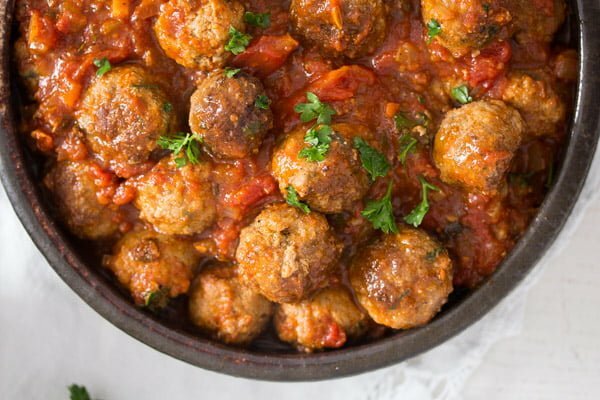 Whatever you choose to do, I can assure you, you will love these Spanish meatballs in tomato sauce. 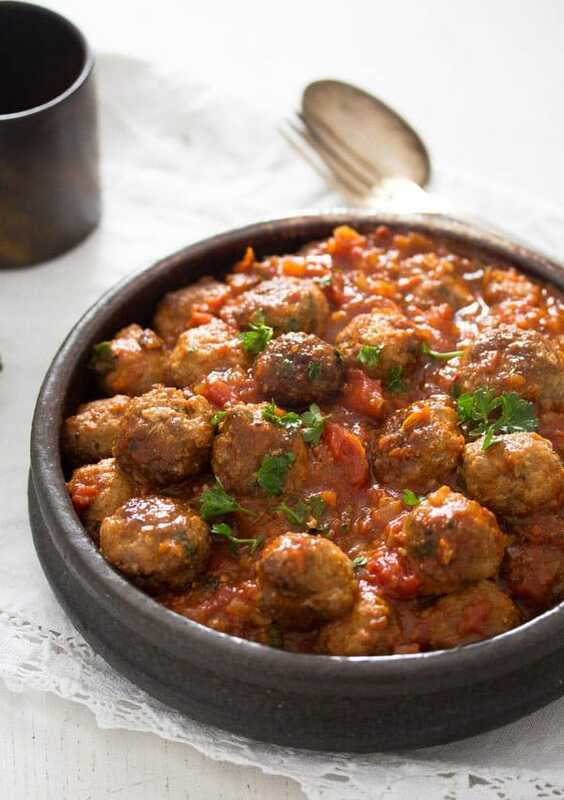 Spanish tapas – albondigas, these are some of the best meatballs in tomato sauce, Spanish food at its best. Give the ground meat, grated garlic cloves, lightly beaten egg, dried breadcrumbs, parsley, sweet, smoked and hot paprika, salt and pepper to a bowl. Mix well with your hand. Form between 30 and 35 small meatballs, about the size of a walnut. Heat the oil in a large skillet. Fry the meatballs (in two batches if necessary) until brown on all sides. This will take about 5 minutes. 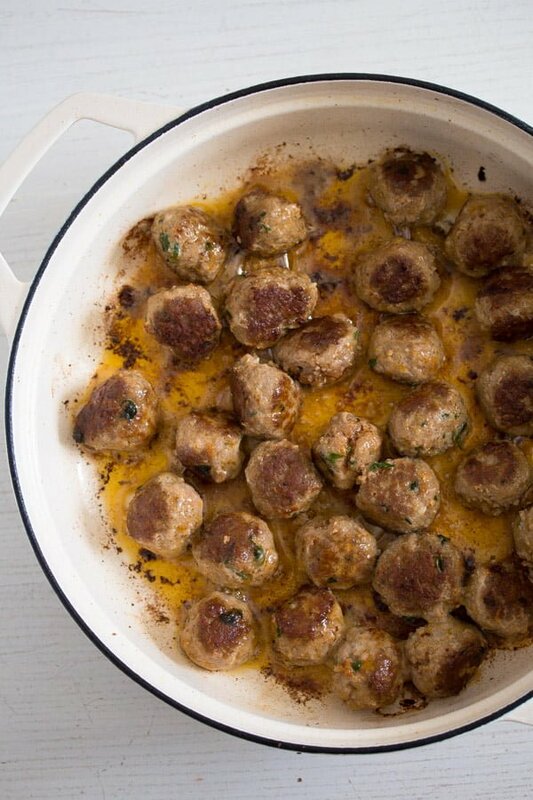 Take the meatballs out of the pan and set aside. Heat the 2 tablespoons olive oil in the same skillet. Add the onion and cook it until translucent. Add the finely chopped garlic cloves and stir for another minute. Add the tomatoes from the can, fennel seeds, oregano, bay leaves, cayenne pepper and chopped parsley. Add some salt and pepper as well. Stir well and bring to a boil. Simmer on medium low heat for 20 minutes or until slightly thickened. Add the meatballs to the pan and heat them in the sauce for about 5 minutes or until cooked through. The recipe for Spanish albondigas serves 4 as a main dish and 8-10 as tapas. The nutrition is calculated for 4 servings. Meatballs are my husband’s top favourite! He will love these for sure.